The latest deadline set by the Nigerian government to stop flaring natural gas from oil wells in the Niger Delta has passed without stopping the flames, which campaigners say are poisoning local people. "Sometimes you can't tell whether it's the dawn breaking or the flame," says activist Vivian Bellonwu, the frustration clear in her voice, after seeing nothing change despite the 1 January target. "It's a history of shifting goal posts, missing deadline after deadline". Everyone agrees gas flaring wastes billions of dollars in useful gas. Campaigners say it causes huge environmental damage and according to doctors, it is responsible for causing chronic health problems among people who live in the Delta. But the government and the oil companies are blaming each other. "It's all insincerity from the government and the companies -they're destroying lives and livelihoods," says Mrs Bellonwu. 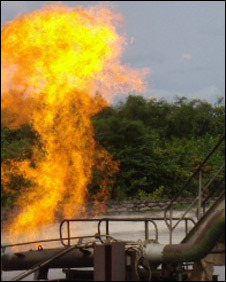 Nigeria flares the second largest volume of gas of any producer, behind Russia. Communities who live near Nigeria's more than 1,000 onshore well heads are blighted by gas plumes that rise from the ground, spreading toxic smoke and chemicals over their farms. Social Action, the organisation Mrs Bellonwu works for, has been representing the communities who live near the many gas flares that light up the watery marshland and mangrove swamps of the Delta. "When you approach a gas flare, the first thing you notice is the heat, the villages around the flares are all very hot." The flames also light up the sky 24 hours a day, and the noise that comes from them is a continuous roar like a jet aircraft taking off. She says doctors have reported higher rates of cancer, children with asthma and a suggestion the burning gasses may be making residents infertile. "The smoke in some places is overpowering. It can't be good." Royal Dutch Shell, the largest operator of onshore wells, has not commented on the claims that gas flaring affects the health of local residents. Nigeria's onshore oil production started in the 1950s. As the oil comes up through the well head, it emerges with little bubbles of gas. But until the 1980s with no way to store or transport it, there was little market for natural gas produced in Nigeria. The operating oil companies simply burned it off. Since then the price of gas has risen, transportation techniques have developed and drilling technology has improved allowing more oil, and consequently more gas, to be drawn through a single well. Now experts believe Nigeria is burning billions of dollars of gas from its aging wells, letting potential profits go up in smoke. Even more ironically, campaigners say, the biggest need for that gas is in Nigeria. Nigeria is in the grip of a power generation crisis and the gas that is being burned could go a long way towards providing the electricity the country desperately needs in order to develop its economy. The government and the oil companies agree they want to end gas flaring. Shell says it has reduced the amount of gas flared by more than 30% since 2000. Shell officials say it is the government's fault that gas flaring still happens. A lot more pipelines would have to be built to collect all the gas. The government isn't keeping up its end of the funding agreements, preventing more investment, they say. Also the government can't guarantee oil workers' security in a region patrolled by armed gangs who kidnap oil company employees. The government oil regulators seem unable to get tough with the companies who operate the wells. It says it can't shut down wells to force them to collect the gas without taking oil wells out of production, losing valuable profit. The minister of state for petroleum told the BBC that while it is true the national oil corporation has a controlling stake in the joint drilling ventures, the responsibility to stop the practice lay with the oil companies. "The operating companies, they are the operators, and clearly they have a responsibility to operate in an environmental way," said Odein Ajumogobia. Two deadlines have been set and passed without making any difference. Mr Ajumogobia said he hopes the problem will come a step closer to being resolved in the next three months. Because oil cartel Opec has ordered Nigeria to make cuts to its production as part of a global attempt to lift oil prices, the government might be able to take some wells out of production to be fitted with gas collecting equipment, Mr Ajumogobia said. They want to start with the wells producing the most gas relative to the amount of oil available. But oil and gas industry analysts are sceptical about the government's ability to carry out the plan. "The ministry could make the plan succeed if they worked systematically and really got tough with the companies," says Alexandra Gillies of Cambridge University, who is researching Nigeria's oil and gas industry. "This kind of decisive action in regulating the industry is what's needed, but it hasn't fared well in the past."